Fruitless Pursuits: Lucky Dice Is A Super Fast / Super Addicting App! Lucky Dice was originally a small, stand alone expansion/supplement to the Carnival board game Kickstarter Project (previously covered here and here). I sadly missed out on this, but I've seen the fantastic graphic design and read about the simple, yet addictive gameplay. You roll 9 dice in groups of 3, and line them up on a tic-tac-toe style grid. After all dice are rolled, points are scored on all 8 possible lines (horizontal, vertical and diagonal). Players get 5 points per pair, 10 points per set of three, and 15 points for a straight (3 in a row numerically). 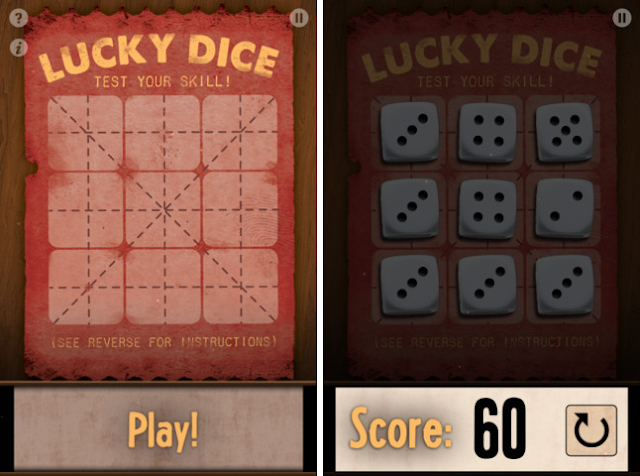 Just this week, publisher Dice Hate Me Games released an iOS version of Lucky Dice, which oddly feels like it's natural home. I hate to say that about a tabletop game, but the ease of use mixed with the portability makes this app really shine. I must have played 30 times in a row last night trying to beat my high score of 75. It took me about 24 hours to beat that with my new high score of 80. Games can be as quick as 1 minute, so it's the perfect game for anytime you have a minute to spare. If you have 10 minutes, it's even better because you will need to play more than once. There's also a handy reset button for each time you get a bad roll and want to quickly restart. Oh and I forgot to mention... THE APP IS FREE!